Description "Add a piece of your life to your bike" with Motordog69's medallion Plate Covers, USA Made. 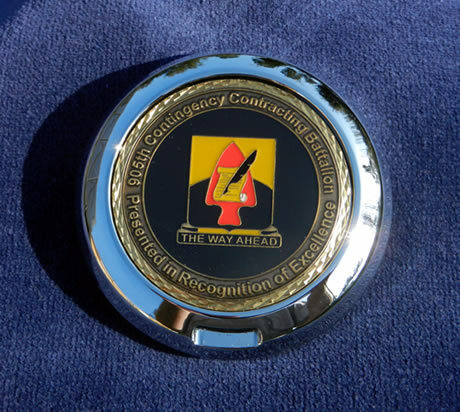 Challenge coin is show for display purpose only. U2 - Allows a rider to easily mount and remove a 2" Challenge Coin on a Harley Air Cleaner, Fuel Door or any motorcycle, car, truck, boat or any item you'd like to personalize. U2 - Mount to any slightly curved or flat surface. U2 - can be mounted permanently with Hi Temp RTV Silicone, or non- permanent with screw holes provided, center bolt is included. U2 - The coin is non-permanently attached with a small amount of same RTV silicone. You can also pop out the coin thru the side slot, then remount a new challenge coin, and get a new personalized look.